Whether you are planning a trip to a local attraction, or headed all the way across the country, you want your vacation to be relaxing. It is a getaway from work, not to mention your day-to-day life. 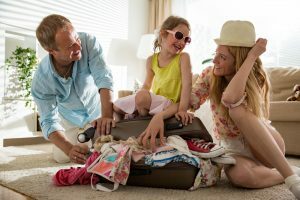 Soucy Insurance has some travel tips – from packing smart to protecting yourself from pickpockets – to make your trip the best it can be. Even if you are only headed for a weekend in Newport, a packing list is a must. How many times have you left home and arrived at your destination, only to find that you forgot your most comfortable walking shoes? Or your swimsuit? Put everything on this list, even if you think you would never forget it. A toothbrush is easy to replace when you get there – your prescription medication is not. For longer vacations, be sure that you have printed itineraries for everyone in your party and make color copies of important ID documents as well. Keep the copies in your bag, separate from your passport and other IDs. It is also a great idea for each person to have a list of emergency numbers, either for them to call or for someone else providing assistance. Do laundry at your destination. Nobody wants to do laundry on vacation, but if you are willing to sacrifice a little time, you can pack far fewer items of clothing. Easy on the shoes. If you can, pack only one or two pairs of shoes. It is best to wear the heavier pair during travel if possible, and pack the lighter one. Ditch the books. Consider using an e-reader instead of packing actual books – that way you can carry hundreds of books on your trip. If you do not own or want an e-reader, you can buy books once you reach your destination. Thrift shops are great places to find inexpensive books. If flying, try not to check your bag. This will not only force you to take smaller pieces of luggage, but with most airlines charging checked-baggage fees, it will save you money. It saves you the hassle of baggage claim, too. Don’t carry much cash. Most places accept credit cards, and those that do not often have ATMs on site. Finally, remember that you are on vacation to relax and escape everyday life. So when you get there, get out there! Meet some locals, do some things off the beaten path. In fact, the locals usually have the best recommendations. For more information on how to protect you and your family at home and while you travel, call Soucy Insurance today at 762.2218.